That has happened in our house three separate times this summer. The fudge also came in handy on National Ice Cream Sundae Day and, of course, on National Hot Fudge Day. When Lilli got terrible stage fright at her Ballet Camp recital, hot fudge worked wonders at soothing a delicate ballerina’s soul. When I told Rich I was going to put a hot fudge recipe on the blog, he thought it was blasphemy, since we live in Northampton, home of Herrell’s and their famous hot fudge. But since I made our own, I haven’t heard much complaining. This hot fudge is what the Editors of Food & Wine have determined to be a “Master Recipe.” It’s just one part of their ice cream sundae section, which also includes Butterscotch Sauce, Strawberry Sauce, Fresh Pineapple Sauce and Mixed Nuts. This is all in the Level 1 section of the book, which means the editors have determined that, for starters, people should all know how to make a good ice cream sundae, along with other easy basics like a roux and macaroni and cheese. I approve of this editorial decision. Food & Wine has been my favorite food magazine for years. When we moved from Boston last year I came across recipes I’d clipped from the magazine back when I lived in Harlem 15 years ago. I still renew my subscription annually, and am genuinely curious as to what is going to happen next as their test kitchens move south. The magazine has never disappointed me, and neither does this book. There are 4 Levels to the book. Level 2 tackles Pho, Yogurt, and Popovers, while Level 3 has you kneading out dough for Challah and making Vermouth. And I look forward to making Tofu from Level 4. Rich does not seem as enthusiastic. The recipe does call for light corn syrup, which I do keep on hand for brittles and certain frostings. I don’t often offer you recipes with the ingredient, and am only doing so because this is a great recipe, one we’ve really enjoyed this summer. It’s worth noting that while I was making the fudge I really couldn’t tell if it was ready or not, but only after I’d stepped away from the stove for bath and bed time and then returned that the sauce had really come into its own. I’ve kept it in the fridge in a leftover salsa jar. I warm it up straight in the jar at 30 second intervals in the microwave. You’ll notice in the photo we had ours with Graeter’s Ice Cream, whose makers wanted me to let you know it’s now available at Wegman’s. As it happened, I bought their Black Raspberry Chip, only to have guests bring the same flavor over from a different company the next night. The difference of quality was easy to see, even before we tasted it. In a medium bowl, combine both chocolates with the butter. Set the bowl over a medium saucepan of simmering water and stir until the chocolate and butter are melted and blended. Remove the bowl and set aside. Pour off the water. In the same saucepan, combine the corn syrup, sugar, salt and 2 cups of water and bring to a boil over high heat. Reduce the heat to moderate and whisk in the melted chocolate. Cook, stirring occasionally, until the sauce is thick and shiny, 18 to 20 minutes. Remove from the heat and stir in the vanilla. Use immediately or let cool completely and refrigerate. Rewarm in a microwave before serving. When I was in college Sylvie and I went on a road trip to Graceland. We actually didn’t make it — there was a dental emergency in Nashville — but the scenery was breathtaking. Honestly, if you’re looking to see some of the best of what the United States has to offer, visit the Blue Ridge and Great Smoky Mountains, and drive the Shenandoah Skyline. The beauty of Appalachia will make you weep. So when I was offered Fruit, A Savor the South cookbook by Nancie McDermott, I jumped at the opportunity: A Southern cookbook based on foods I could actually eat. Well, sort of. There are some fruits I just can’t find up here, and some I’ve never even heard of, like mayhaws, scuppernong grapes, and pawpaws. But for the fruit I can get hold of, the recipes are terrific: fresh peach fritters, watermelon-rind pickles, Okracoke Island Fig Cake with Buttermilk Glaze, horchata made with cantaloupe seeds. The recipe I decided to share with you is the strawberry shrub. I figured most of you have best access to strawberries. A shrub is a fruited drinking vinegar that has its roots in the sultry climates. The root of the word is from the Arabic sharab, which means “to drink”. We cut ours with seltzer from the Soda Stream and it was refreshing and delicious on a warm July night. It’s a bit like having a homemade Italian soda, now that I think about it. Rich put some in a beer, and said it was a little like a Berliner Weisse, a sour wheat beer often drunk with raspberry syrup. In this case, the tartness comes from the syrup instead of from the beer. The recipe calls for the jar to be set aside in a cool, dark place for 24 – 48 hours and to make sure the jar is not exposed to heat or light. I tucked mine away in the basement for two days. But since I found a snake in the basement last night, I’m never going back down there again. I’ll have to find another place to age my shrubs. Wash in very hot soapy water. Do not dry the washed bottles or jars, but put them upright on a baking sheet, about 2 inches apart, and put in the oven. Turn on the heat to 350F and once the oven has reached this temperature, leave the bottles or jars in the oven for 20 minutes to ensure they are completely sterilized. Wear protective oven mitts when handling hot bottles and jars. Prepare a large glass jar with a tight-fitting lid as directed. 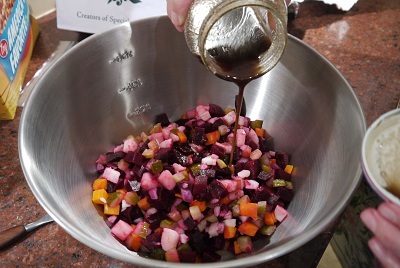 Strain the vinegar into a medium saucepan and discard the solids. Add the sugar to the vinegar and bring to a rolling boil, stirring to dissolve the sugar. As soon as the sugar is dissolved, remove the pan from the heat and let the shrub cool to room temperature. Pour the shrub into a clean, sterilized jar and cover tightly. Store in the refrigerator for up to 6 months. Oh goodness. Where to begin? Well, first off, I shouldn’t be writing this right now. What I should be doing while Lilli takes her nap is tidy up the house. Or maybe crowd source the name of a cleaning lady. The house looks like an 18-month-old lives here…on her own. My friend Sara called Lilli the “tiny tornado” a few months back, and the local children’s librarian referred to her as a “little tornado” just last night. So the house is beyond a disaster, and no, I will not post any photos of that. Like I said, I should be cleaning the house right now, but instead I’m going to tell you about vegan ice cream sandwiches. Before I go any further, Rich wants me to make it clear that he did not have any of the vegan ice cream sandwiches. When the book Vegan Ice Cream Sandwiches by Kris Holechek Peters arrived in the mail I was excited at the prospect of a delicious and creative summertime dairy-free dessert. And Rich? Well, he made a face and declared, quite forcefully, I might add, something he has said for years: “Dairy-free ice cream is an abomination against nature.” I’ve learned to pick my battles, so I let this one slide. As with any ice cream recipe, make sure to have your charger in the freezer overnight. These particular cookies are a slab cookie, although there are drop cookies galore in the book. You’ll notice the recipe has you make the sandwiches, then wrap them in plastic wrap and pop them back in the freezer for a half hour to bind them. It also suggests having the ice cream sit out for a half hour. I guess that’s typical for soy-based ice creams, although the ice cream was ready to scoop after only a few minutes out on the counter. And the result? Well, at first taste the soy ice cream tasted like Tofutti, but that soy flavor diminished after a few days. The cookies were, legit, delicious — so delicious that Rich ended up eating ALL OF THE COOKIES, except for two. (He swears he thought I’d already assembled the sandwiches and the cookies were left overs.) 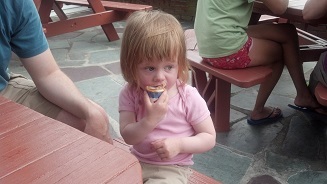 That means I only had one ice cream sandwich when all was said and done. That’s right, he refused to eat the ice cream sandwiches, but then went and ate all the cookies. I take that as a good sign. This ice cream sandwich was WAY BETTER than a Tofutti Cutie. For those of you out there that are looking for a Saturday lunchtime dessert that’s dairy free and delicious, this is a game changer. In a medium bowl, cream together the margarine and sugar. Stir in the milk, vinegar, and vanilla. In a small bowl, combine the flour, cocoa, baking powder, and salt. Add the dry ingredients to the wet and mix thoroughly. Turn out onto the prepared baking sheet. Place a sheet of waxed paper over the dough and roll out onto a square about ¼ inch thick. Remove the waxed paper and bake for 10 to 12 minutes, until the edges are set and it’s slightly puffy. It will seem soft and not fully baked, but it is. Remove from the oven and let cool for about 15 minutes on the baking sheet on a wire rack. Carefully cut the cookies into the desired shape. You can use a glass or biscuit cutter to make them round, or maximize the dough by cutting them into evenly sized squares. Remove the cookies from the sheet and allow to finish cooling on the rack. In a large saucepan, combine the sugar and tapioca starch and whisk until incorporated. Pour in the milk, whisking to incorporate. Over medium heat, bring the mixture to a boil, whisking frequently. Once it reaches a boil, lower the heat to medium-low and whisk constantly until the mixture thickens and coats the back of a spoon, about 5 minutes. Remove from the heat, add the coconut oil and vanilla, and mix to combine. Transfer the mixture to a heat-resistant bowl and let cool completely. Pour the mixture into the bowl of a 1 ½ or 2-quart ice cream maker and process according to the manufacturer’s instructions. 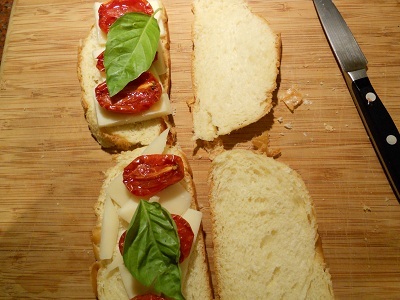 Store in an airtight container in the freezer for at least 2 hours before assembling the sandwiches. 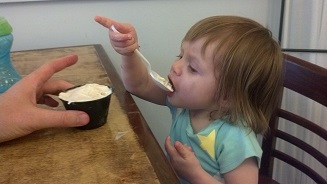 Let the ice cream soften slightly so it’s easy to scoop. Place half of the cookies, bottoms up, on a clean surface. Scoop one generous scoop of ice cream, about 1/3 cup, onto the top of each cookie. Top the ice cream with the remaining cookies, with the cookie bottoms touching the ice cream. Gently press down on the cookies to level them. Wrap each sandwich in plastic wrap or waxed paper and return to the freezer for at least 30 minutes before serving. 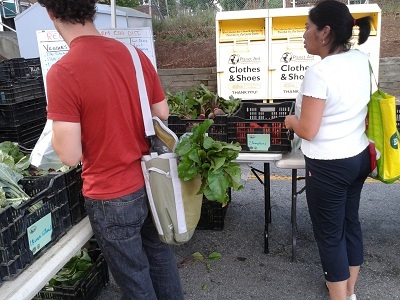 Our summer CSA started last week. While some people complain that receiving a box of predetermined vegetables every week is too limiting, I’ve really grown to love working with ours. I’m really at my happiest with our magic box of tricks on the counter. Rich jokes that if I was a rapper, my name would be MC CSA. So far this week, the arugula has been made into a garlicky pasta topped with golden raisins. 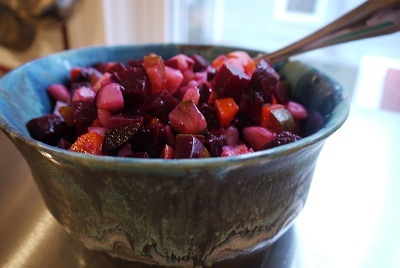 The leaves have also made their way into a salad of roasted beets (also from the box) and stinky blue cheese. Last night, we had an outstanding miso soup featuring steamed mizuna (a Japanese lettuce) and carrots, both from the CSA. To the pot I added a few pantry goodies, dried shiitake mushrooms, some absolutely ancient seaweed, and fresh matchsticks of ginger. I filled the bottom of each bowl with a ladleful of barley (pressure cooker, ‘natch) and tied it altogether with another CSA goodie, spring onion. I did a bit of digging around for a green onion and cheddar biscuit recipe, but couldn’t come up with something that pleased me. Or, as I lamented to Aleza, “Why is there bacon in every one of these biscuit recipes?! ?” She comforted me with the knowledge that people are stupid when it comes to pig, and suggested I find a biscuit recipe, add the cheese to the dry ingredients, and then add the onion when I added the cream. Simple enough. I found the recipe in The Fannie Farmer Cookbook — about as American as you can get. 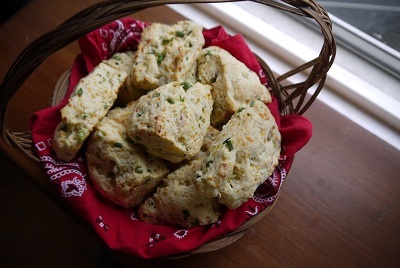 It’s a James Beard recipe, which to me makes perfect sense: leave it to a Southern gourmand to have a perfect biscuit recipe. Preheat oven to 425F. Use an ungreased baking sheet. Combine the flour, salt, baking powder, sugar and cheese in a mixing bowl. Stir the dry ingredients with a fork to blend and lighten. Slowly add 1 cup of the cream to the mixture, stirring constantly. 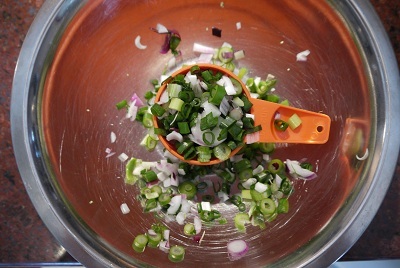 Halfway through adding the cream, add the green onions. Stir constantly. Gather the dough together; when it holds together and feels tender, it is ready to knead. But if it seems shaggy and pieces are dry and falling away, then slowly add enough additional cream to make the dough hold together. Place the dough on a lightly floured board and knead the dough for 1 minute. Pat the dough into a square about ½ inch thick. Cut into twelve squares and dip each into the melted butter so all sides are coated. 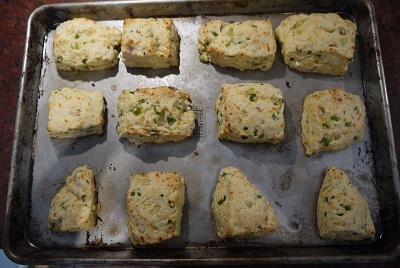 Place the biscuits 2 inches apart on the baking sheet. Bake for about 15 minutes or until they are lightly browned. Serve hot. I’m writing this while wearing my slippers, which I had to dig out of the front hall closet. The cat is curled up like a cinnamon bun in Rich’s lap, hoping to enjoy his body warmth (and vice versa). This week’s CSA box had both a butternut squash and six ears of corn – one box, two seasons. Summer is tiptoeing its way out and fall is tap dancing its way in. 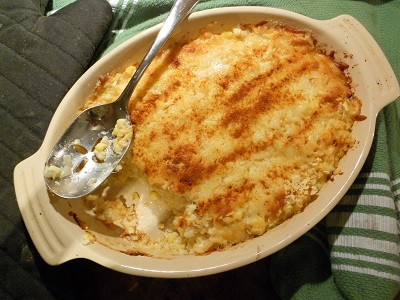 Fresh corn pudding, I have discovered, is the perfect mix of late summer and early fall. Each creamy bite of this comforting dish is both sweet and savory, a reminder of why this time of year is my favorite food season. This recipe is from Deborah Madison’s America: The Vegetarian Table, which is where I found the persimmon pudding recipe. What can I say, the woman knows her puddings! Lightly butter a 6-cup shallow casserole or gratin dish. If using saltines, put them in a bag and roll over them with a rolling pin to make coarse crumbs. There should be about ¾ cup. Set aside. Shuck the corn and pull of the silks. If you slice your corn in a deep bowl, you’ll keep it from spattering all over. Holding an ear of corn stem end down and using a sharp knife, carefully cut off the top halves of the corn kernels; do not include the fibrous base, the part that gets caught in your teeth. Then turn your knife over and, using the dull side, press it down the length of the cob, squeezing out the rest of the corn and the milk. You’ll end up with a mushy substance in the bottom of the bowl along with the kernels. Repeat with the remaining ears. Warm the oil or butter in a skillet over medium-high heat. Add the onions and cook just until limp, about 4 minutes. Add the garlic and cook for 2 to 3 minutes without letting the onions brown. Add this to the corn and stir in the milk, eggs, 1 cup of the cheese, and ½ cup of the cracker crumbs. Season to taste with salt and pepper. Transfer the mixture to the prepared dish and top with the remaining cracker crumbs and cheese. Bake on the center rack of the oven until puffed and golden, about 45 minutes. Remove from the oven, sprinkle paprika over the top, and serve. A few years back, inspired by some reading about eating locally and seasonally, I announced to Rich that we would not be having tomatoes on a regular basis. Tomatoes, I explained (OK, really declared), would only be eaten in the summer time, mostly in August, but the eating and serving of could begin in mid-July and last through the end of September. Perhaps some of October, if we were lucky. And that’s how it’s been, more or less, for a good while now. 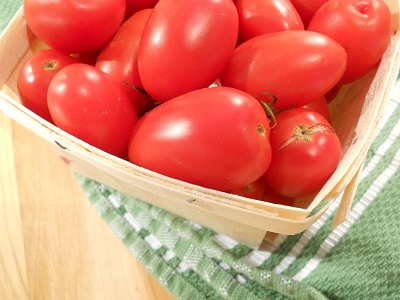 I think once or twice a plastic box of grape tomatoes snuck their way onto the counter and were used in a hearts of palm and avocado salad. But really, the first tomatoes I purchased this year were when Cousin David came the second week of July. They ended up on a platter of Caprese salad for the neighborhood potluck. Two weeks back I received some tomatoes in the CSA. They weren’t quite ripe, light pink and still a little hard to the touch. I set them on the counter on Thursday night and walked away. By Sunday, I could tell by looking at them that they’d be ready to eat by Wednesday, nearly a whole week after they first hit the kitchen. Torture! I then spent the next three days thinking about my midweek lunch, which would be the tomato. No cheese, no bread, just a little pesto I whipped up Tuesday night with some basil I rescued from the fridge. I also found some leftover roasted garlic hummus in there, so I ended up alternating bites: ripe tomato with pesto, then the garlicky hummus. I was quite a happy camper. For Thursday’s lunch, I ate the next tomato, this time with a perfectly ripe avocado that I peeled and sliced next to it. (And yes, I do see the irony of insisting on a local, seasonal tomato while eating a trucked-in avocado next to it.) I keep bottles of olive oil and balsamic vinegar in my desk at work, so I drizzled a little of each on the two, and ate my lunch. There may have been some moaning; I’ve been told I have a problem making inappropriate noises when eating certain summer produce. There may have been an incident earlier this summer with a peach. This past week brought a new batch of tomatoes to the house: Juliet, a type of heirloom grape tomato. They look like a miniature plum tomato, and when I get near a plum tomato, I have the sudden urge to slow-roast it. Now, I know turning on the oven in August sounds questionable, but the nights do get cooler, and really, the oven is only at 250 degrees the entire time. The end result is more sweet than savory. The tomato proves itself to be a terrific fruit: It’s tomato candy, really. I came across this recipe in Saveur magazine in 2007. It was a feature on the 25th anniversary edition of The Silver Palate Cook Book, a collection of recipes developed by Julee Rosso and Sheila Lukins in their little gourmet shop in New York City. I clipped the recipe and roasted a batch that very same week. And then I went and did something I don’t do very often: I went and bought the cookbook. No trial period with the library, just straight to Amazon. It turned out to be a great buy. Sometimes you can just tell from one simple recipe. As I mentioned, today I used the Juliets, but I usually do this with plum. I’ve read that people eat these on top of pasta, as a side to chicken and fish, or maybe on top of some beans. I usually eat them off the baking sheet. Once they made it all the way onto an antipasto plate, next to some olives, hard cheese, and roasted red peppers — once. Every other time, they’ve gone directly into my mouth. Today I tried to exercise restraint. 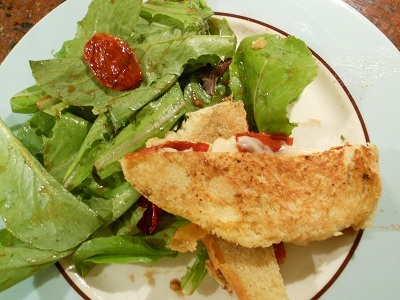 I used some in a grilled cheese sandwich (fontina) and tossed on top of some greens and roasted radishes, with a sweet balsamic dressing drizzled on top. Don’t let the number of tomatoes used in this recipe deter you: You can make it with fewer, just reduce the amount of oil and sugar for the whole tray. I don’t always have the fresh herbs on hand to garnish. Not that I’ve let that stop me. 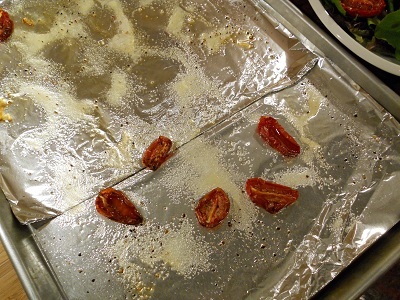 Line a baking sheet with aluminum foil and oil it lightly. Arrange the tomatoes on it a single layer, cut side up. Drizzle lightly with the remaining olive oil and sprinkle with the sugar and pepper. Bake the tomatoes until they are juicy yet wrinkled a bit, 3 hours. Carefully transfer the tomatoes to a platter. Just before serving, sprinkle them salt and garnish with the herb leaves.